Download and install Ruby (if you’re on windows try the one click installer) and install rubygems too. in your source code there is a config folder with an automagically created “database.yml” file. Edit this to only show the “test” section as we’re only going to be running rake tests. 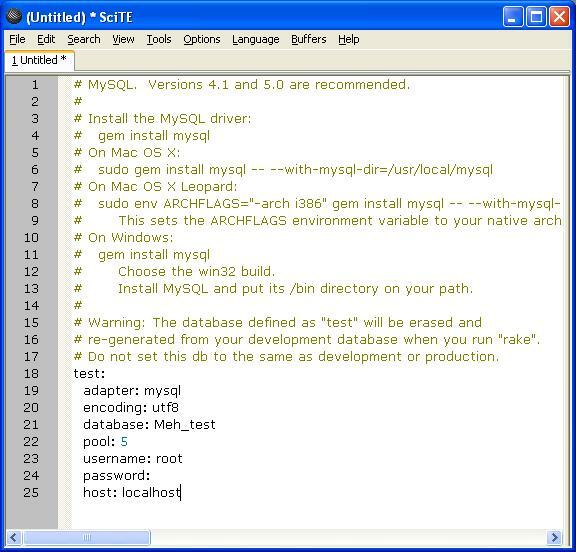 If you’re on a windows box you’ll see a few errors, in which case you need to (courtesy of the MySQL forum post below) download http://instantrails.rubyforge.org/svn/trunk/InstantRails-win/InstantRails/mysql/bin/libmySQL.dll and save it to your Ruby bin directory. this should run all your tests.